A wheelchair-accessible kitchen built by Daniels Corp.
After years of fruitless searching, Tim and Natalie Rose, a Toronto couple in their early 30s, had all but given up finding a suitable condo in the city. Their story, however, doesn't involve the usual litany of impediments – price, location, size. Rather, Mr. Rose, a bank compliance officer who has cerebral palsy and relies on a wheelchair, couldn't find an apartment that met his accessibility needs. Instead, he and Ms. Rose, a graduate student in rehab science who is able-bodied, have had to settle for rental apartments that they'd fix up as best they could. "We'd kind of given up on finding an accessible property," he said last week. But earlier this month, they heard from Jeff Kerr, a Re/Max broker who specializes in accessible housing. He told them that Daniels Corp. will be developing two projects, in Regent Park and Mississauga City Centre, that allow buyers to add a range of accessible amenities in the design stage with no additional cost. The couple hustled to the sales office and immediately put down a deposit on the $585,000 two-bedroom, two-bathroom unit. "It was like finding a unicorn," Ms. Rose said. "We had to jump at the chance." 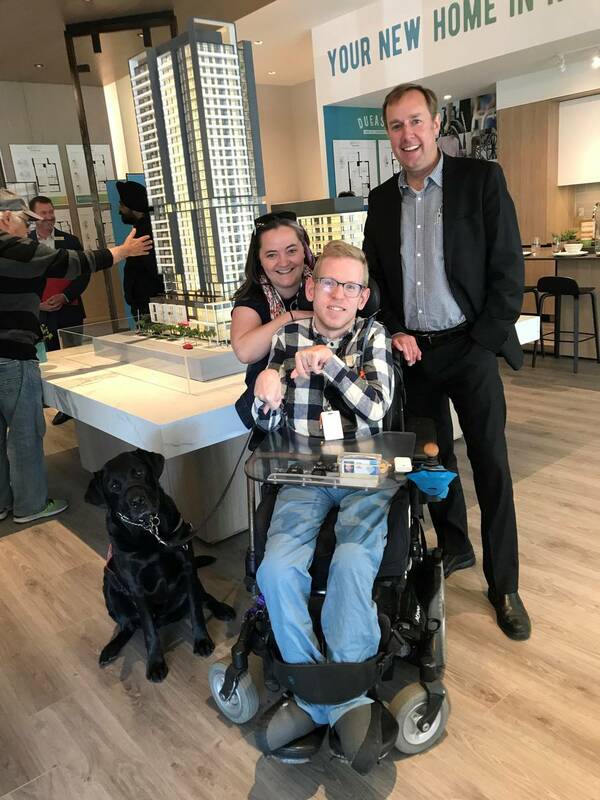 According to Jake Cohen, Daniels' vice-president for project implementation, the option of acquiring accessible units will become standard on all the company's projects, with 15 per cent of all new units qualifying as barrier-free apartments. If they aren't sold during the preconstruction phase, Daniels' property management arm will manage them as rentals. "We're going to build them regardless." The decision to offer customized accessible apartments isn't merely a good deed – it's a response to consumer demand and evolving demographic trends, Mr. Cohen says. "We knew there was a market out there." It includes people with various physical disabilities and older buyers who are looking for accommodation where they can age in place. As Mr. Rose points out, there's very little available beyond purpose-built social housing complexes, which are available only to low-income tenants. Mr. Kerr, who specializes in accessible real estate, says the supply shortages represent a long-standing gap in the market. The last time a building offering preconstruction accessibility features opened was 20 years ago, he says. "The design wasn't great." Nothing's come onto the market since. Mr. Kerr, who got into this field because of a relative who suffered from a debilitating condition, describes Daniels' move as "a game-changer." The units, which vary in price from the low $200,000s to over $500,000, feature amenities such as roll-in showers (i.e., without a lip), grab bars, under-sink clearance on vanities, kitchens with lower counters, adequate turnaround space and balconies accessible via a swinging door instead of sliding doors on raised tracks. Mr. Cohen says they're customizable, as not all buyers want all the options. Most builders don't currently offer accessibility as a standard option, say Mr. Cohen and Mr. Kerr. Adding such features or retrofitting an existing unit can run to thousands or tens of thousands of dollars, as the Roses learned when they made inquiries with other condo projects. "The key is doing it ahead of construction," Mr. Cohen says. Lorene Casiez, an accessibility specialist with Quadrangle Architects, which is designing the units, points out that there's a common misperception that buildings must satisfy the 2005 Access to Ontarians with Disabilities Act. The more relevant standard, she says, is the Ontario Building Code. A wheelchair-accessible bathroom with a barrier-free shower. Daniels says its projects will surpass both by addressing accessibility within individual units and also throughout the building; for example, elevators with voice functions, level entries, push-button doors, and so on. That approach is rooted in the " universal design" school, which espouses architecture that incorporates principles such as flexibility, equity and barrier-free access in all elements of a project. Such design thinking, Ms. Casiez adds, "are seamless. People say these spaces feel great and they're not just jammed in." Mr. Kerr points out that for people with physical or perception impairments or those who have friends or relatives with these conditions, such buildings are "visitable" because they have "entrance solutions and bathroom solutions." Daniels is allowing buyers to select what they need from the menu of accessible options. With some couples, the able-bodied spouse may be the primary user of the kitchen, which means the unit won't need the same kinds of counter and appliance treatments as would be required for someone who is disabled but expects to be cooking regularly. As they look ahead to their new apartment, the Roses are keenly aware of the fact that they, like many other people in similar circumstances, had few alternatives. "It was kind of this or nothing," Ms. Rose says. "We have no choice in the market." Despite the limitations of not being able to shop around or pit one developer against another to get the best price, they nonetheless feel the Daniels project has allowed them to surmount a previously insurmountable hurdle in a city obsessed with places to live. As Ms. Rose says, "It just makes you feel you're on the same footing with other homebuyers."